Stuffy Nose - The sensation of stuffy nose, often described in medical terms as nasal obstruction, can have a variety of causes, from the temporary, such as congestion due to a cold or allergies, to more persistent obstruction caused by swelling of the turbinates, or by a malformation of the airway. 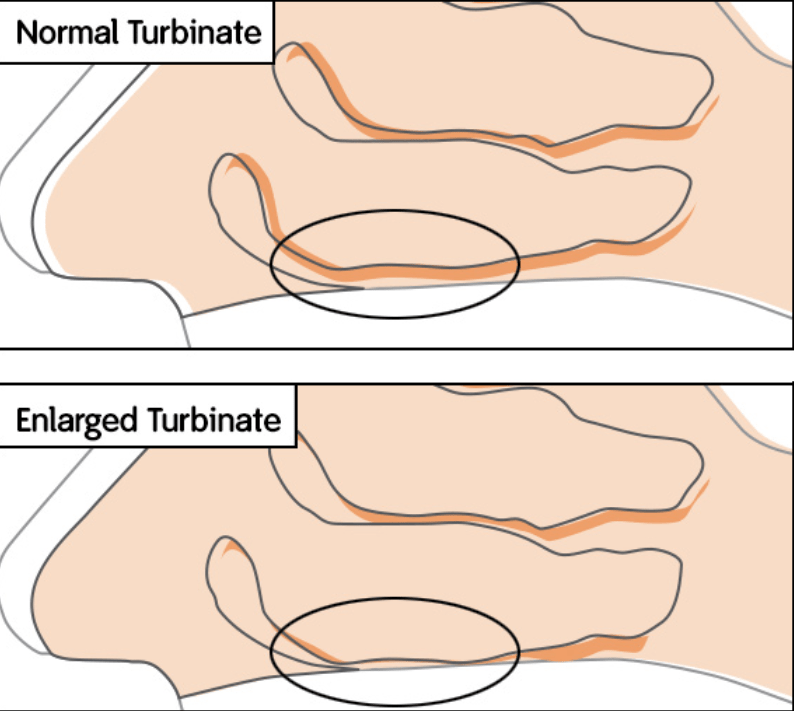 Hypertrophic Turbinates - When they become enlarged, the turbinates, particularly the lowest, or inferior turbinate, can block nasal airflow. 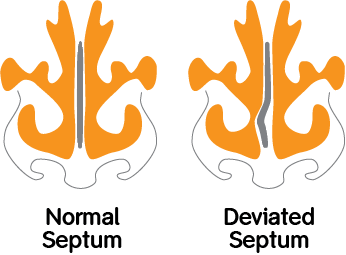 Deviated Septum - The septum is a narrow structure of cartilage and bone, lined with mucosal tissue like the turbinates, that forms the wall between the right and left nasal airways. The septum can be displaced to one side from birth, or because of injury. The result is that one nasal passage is narrower than the other, which causes obstruction and can lead to swollen turbinates due to the imbalance in air flow. Allergic Rhinitis and Hay Fever - Rhinitis is the medical term for inflammation and swelling of the nasal passages. One cause of rhinitis is allergic reaction to inhaled substances, for example, dust, pollen or pet dander. In some cases, an allergy to food can cause swollen airways. Nasal Valve Collapse - The nasal valve is the section of the airway located just beyond the nostrils. If the fleshy tunnels that form the airway are narrow or overly flexible, they can collapse inward as you inhale. Sometimes visible from the outside, nasal valve collapse restricts the flow of air, causing the stuffy nose sensation. One of the most advanced new surgical approaches, COBLATION turbinate reduction is being offered as a doctor’s office procedure, meaning less down time, no general anesthesia, and lower cost than with a hospital stay. COBLATION technology combines low-temperature radio frequency energy with saline to create a plasma field, which is contained at the tip of the device; it dissolves tissues at the molecular level, resulting in a precise dissection of targeted tissue. Request your appointment with Dr. Raja today!